The chimney has been a part of family life since the early Romans first realized that it was better to live in a nice, fire-warmed home than in a chilly one. They constructed the chimney and flue as a way to funnel off the smoke caused by log fires out to the roof. However for centuries, few homes had adopted this practice and homes were heated primarily by a central wood fire burning on hearthstones that was situated in the middle of the room or against one wall. The smoke from the fire simply drifted out the windows, doors, or through openings in the roof. It was not until the 16th century, primarily in medieval England, as new homes were built or older homes transformed to provide greater comfort that the fireplace and chimney became widespread as a distinct heating appliance and also to provide a safe place for indoor cooking. 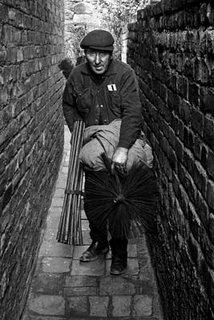 Although the origins of chimney sweeping can be traced back to the medieval period, chimney sweeping really developed as a fully established profession in England during the 17th and 18th centuries. As people began to appreciate the benefit of the fireplace and chimney, they demanded more and more fireplaces be added to their homes to heat individual rooms, and soon there were fireplaces in every room. During this same time period, citizens were assessed a hearth tax. The amount of tax paid was determined by the size of the house, which in turn was determined by the number of chimneys that were present. To reduce the tax burden, flues venting the additional fireplaces were added within the existing chimney spaces, and these would often connect together in a complicated maze of completely dark tunnels. As the number of flues within the chimneys increased, their sizes decreased. As such, flues became increasingly narrow. During this same time period, the use of coal began to grow in popularity and began to replace wood as a fuel source. Coal makes a sticky soot which does not all come loose with the use of a brush; chimney edges need scraping where soot builds up. People soon realized that fireplaces and their chimneys needed a cleaning, as a house full of soot and fumes is unhealthy. And so, the necessity of regular chimney sweeping began. People liked having the chimney sweep pay a visit as he brought clean, fresh air back to the home and thus the chimney sweep became associated with good health, hearth, and home. With the onset of the Industrial Revolution the chimney sweep profession thrived. In Victorian London, for example, every surface was coated with soot from the widespread use of coal as a heating fuel. New buildings being constructed of Portland stone didn’t stay pristine for long. The air people breathed was often foggy with the smoke from the chimneys that vented the many coal fires coming from the crowded housing of the city. It is said that living conditions were so bad that Queen Victoria ordered that all flues, or chimneys, be swept often. In Victorian London, well over 1,000 Chimney Sweeps served the city. The continued expansion of coal as the main fuel for domestic heating ensured that the trade continued to flourish. 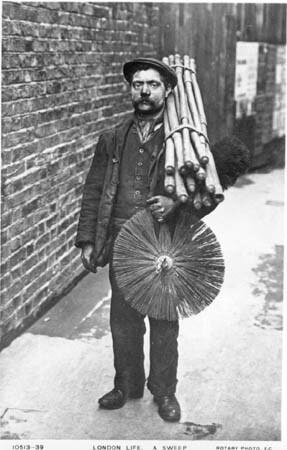 Needless to say, the chimney sweep profession has changed since the early Victorian days. During the early 1960’s the switch to other, more convenient forms of heating – gas and electricity in particular, replaced coal as the primary source for central heating . As such, the chimney sweep profession died down. However, with the two oil crises in the 1970’s, prices of fossil heating fuels soared and many people decided to go back to cutting and burning their own wood. Often this was done using fireplaces that had not been properly cleaned or serviced in a very long time causing many chimney and house fires as well as carbon monoxide poisonings from blocked chimneys. Over the years, the fireplace has emerged from its slumber as merely an architectural decoration into a fully functioning appliance. As the popularity of fireplaces increased, so has the need for chimney sweeps, an old profession that is still growing today.